"Access to information means nothing when freedom of expression is not protected", - Open Data Institute. The Tanzania Basic Statistics Portal provides open data in a machine-readable format to be used and re-used by anybody. The data produced or commissioned is prioritized for Education, Water and Health sectors. By re-using this publicly available data, a wide range of actors can be brought into the policy processes and debates, creating valuable new ideas and new thinking to policy making, monitoring and citizen feedback. 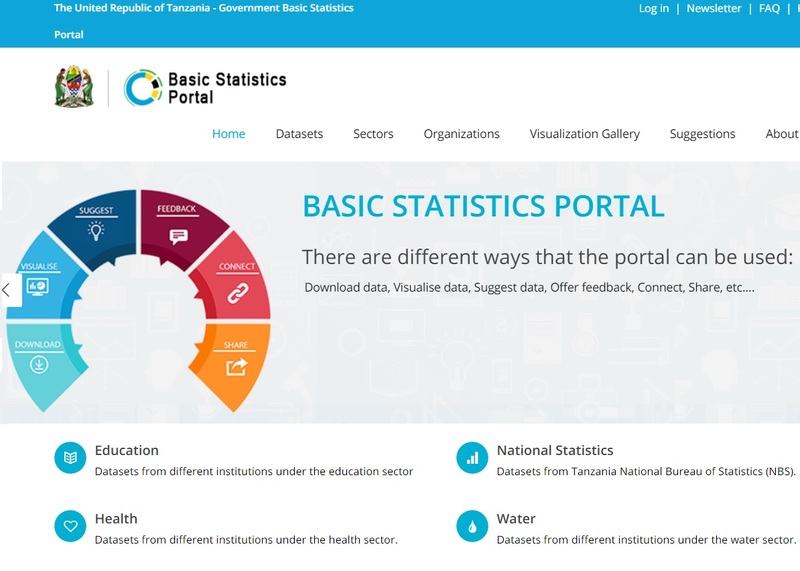 The Basic Statistics Portal is managed by the Basic Statistics working group comprising of Tanzania National Bureau of Statistics (NBS) under the Ministry of Finance, e-Government Agency of Tanzania and National Archive Department under the Tanzania President’s Office Public Services Management. This working group is responsible for overseeing the sustainable establishment of Basic Statistics initiatives in Tanzania. Tanzania joined the Open Government Partnership in 2011, launched its Open Data Initiative a year later. The Tanzania Basic Statistics Portal was launched in March 2015 and published its first datasets for Education, Water and Health sectors. To help clean, organise, publish and use data of this portal, over the last two years, Open Data Institute (ODI) together with the World Bank have provided extension training and offered their support to all interesting parties using data of the Tanzania Basic Statistics Portal. The initiative was supported by the UK Department for International Development (DfID). Four tailored e-learning modules were developed to help people explore available data management tools and practice data skills. The modules are free for anyone to access and use. To ensure the Tanzania Open Data Initiative can have sustainable impacts, ODI trained in-country trainers to deliver their own open data training. For more ODI's initiatives take a look at ODI portal, follow ODI on Twitter @ODIHQ. Deposit your research data as FAIR Data with help of REPOSITORY FINDER! ​You are welcome to Sign up for AIMS News, follow @AIMS_Community on Twitter... And, thanks again for your interest !